Albert Chan a returning client from Singapore visited the highly prolific IT Monster Lake some two hours west of Bangkok on day two of his Thailand fly fishing holiday. After a highly eventful days fly fishing the previous day at the Barramundi ponds in Chachoengsao Albert once again chose to use fly fishing techniques. Using a stepped up # 10 Fly outfit Albert was soon into the hungry predatory fish of Lake Monsters. After expertly teasing his carefully tied fly presentation across the surface of the lake Albert’s fly was engulfed by a large swirl on the waters surface before line was stripped violently from the anglers centre pin reel. 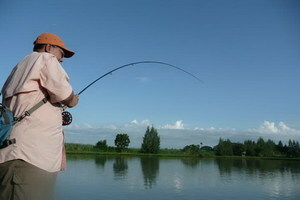 With the rod arched over to its full parabolic curve the angler desperately held on as line disappeared from the spool. Albert was forced to follow the unseen predatory along the bank whilst desperately trying to regain line back onto the spool. The battle continued for some thirty five minutes before a large Redtail Catfish was finally netted. The fish was weighed at 29kg’s before being released. The Singaporean angler continued to catch predatory fish throughout the day with Alligator Gar, Asian Redtail Catfish and Pacu all succumbing to his carefully presented flies. Albert captured several more large Redtail Catfish with weights ranging between 15 and 30kg’s which continued to put his # 10 Fly outfit through its paces. At the end of the days angling at this highly prolific fly fishing venue Albert had amassed a twenty fish haul consisting of a variety of imported and native predatory species with weights to 30kg+.